Our many years of experience tells us that our customers deserve nothing less than 100% service and satisfaction. By employing the best technicians, all professional, courteous and knowledgeable, that 100% satisfaction record is easily maintained. With knowledge of all the latest technology and techniques, we feel that we are the #1 company when it comes to cooling, heating or plumbing work. Our reputation in the Summerdale area is nothing short of excellent, we’ve kept it that way for many years. Whatever type of plumbing service that you need – sump pump repairs, water heater installation or ‘just’ drain cleaning (and everything in between), our professionals will do the best job for you, with minimum disruption. 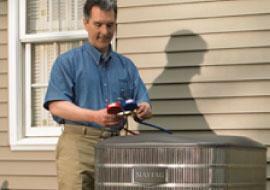 Whether it’s commercial or residential plumbing you need, talk to the friendly professionals. With ongoing and constant training, our technicians deliver to the highest standards every time, even in a 24-hour emergency situation. They will arrive in a fully stocked service vehicle and their knowledge means that work will be completed in the shortest time possible. We have kept up with technology for many years – supplying the latest and most energy efficient heating systems is what we are known for. If you’re looking for a new installation, we are sure to be able to save you money. For every type of heating service need, talk to the professionals at David Leroy, they have the answers to all of your questions. Though small, Summerdale had one of the most interesting beginnings of all towns in Pennsylvania. Founded in 1909, Summerdale began as a dance hall erected by summer visitors from Harrisburg who wanted to dance and party. Today there are only 479 people residing within the town, but it is still a popular summer attraction. Many people like to visit Central Pennsylvania College, the Capitol Area Intermediate Unit, and the Summerdale United Methodist Church.